Gas Prices Up 25 Cents in 2012 - $4 Gas Coming Soon to U.S.
Gas Prices Up 25 Cents in 2012 – $4 Gas Coming Soon to U.S.
Gas prices have never been higher this time of the year in the U.S.
Monday’s retail price for a gallon of regular gas in the U.S. is $3.56, up 5% in the past week alone, according to the AAA Fuel Gauge Report. Gas prices are already up over 25 cents since Jan. 1. And the Oil Price Information Service predicts that gasoline prices could reach a record $4.25 a gallon by late April. That would top the record of $4.11 in July 2008. The national average for gasoline began the year at $3.28 a gallon. The average price for February so far is $3.49 a gallon. That’s up from $3.17 a gallon last February, a record at the time. Back in 2007, before the recession hit, the average for February was $2.25 a gallon. 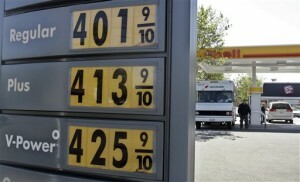 If these price hikes continue, states like California may see $5 gas prices this summer. This weekend I paid $4.18 a gallon in La Jolla, CA. After a winter of slight increases, the average cost of a gallon of regular unleaded gas in the Riverside-San Bernardino region leapt 16 cents in eight days — and a nickel overnight — to $3.95 on Friday. Tom Kloza, a conservative analyst with the Oil Price Information Service, said, “You may indeed have to pay $5 (per gallon) if you buy your summer gasoline on a tropical island, Martha’s Vineyard, or one of the tonier suburbs of New York, San Francisco, or Los Angeles,” Kloza wrote Friday on his blog. Oil prices are also rising due to the West’s growing tension with Iran and unexpected news that the People’s Bank of China is reducing banks’ reserve requirements for the second time since November. Oil prices jumped to a nine-month high above $105 a barrel on Monday after Iran said it halted crude exports to Britain and France in an escalation of a dispute over the Middle Eastern country’s nuclear program. This is as high as crude has traded since last May when it peaked above $114 on fears that the wave of revolutions in Arab countries like Egypt and Libya would disrupt supplies. Back then, the average price of a gallon of unleaded gasoline for U.S. drivers hit $3.96. High oil and gas prices now set the stage for even sharper increases at the pump because gas typically rises in March and April. Higher gas prices could hurt consumer spending and curtail the recent improvement in the U.S. economy. A 25-cent jump in gasoline prices, if sustained over a year, would cost the economy about $35 billion US. That’s only 0.2 per cent of the total U.S. economy, but economists say it’s a meaningful amount, especially at a time when growth is only so-so. The economy grew 2.8 per cent in the fourth quarter, a rate considered modest following a recession.